Oyster&Chop is devoted to doing classic food better - food you'll love, with the best service we can provide. We opened our specialty steak restaurant and oyster bar in October 2015, on Market Square, at the Customs Street West end of Auckland’s Viaduct Harbour. With great water views out over the Viaduct Harbour basin, the restaurant is designed for a comfy and special dining experience, either indoors where you can view your food being prepared in our open kitchen or outdoors where you can take in the boats and people that make the Viaduct Auckland's dining hub. 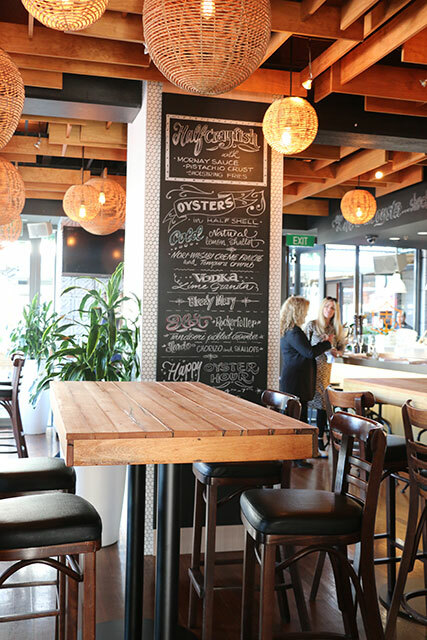 We're proud to have the best oyster bar in Auckland. At any one time we have up to 10 varieties of oyster, freshly shucked, prepared or cooked, and served, in our bright and breezy oyster bar. Happy Hour, each day between 4 and 6pm is the place to be in central Auckland for $2.50 oysters and great company! Of course, we love red meat. If you’re a devoted carnivore like us, you'll love our extensive steak menu served with your choice of classic sauces and delicious sides and, our favourite, shared steak boards. beer-battered fish and steakhouse fries. And to finish off your meal, there’s nothing better than our desserts like 70% chocolate mousse, affogato or peaches and cream brulee. It’s pretty much a given that a good restaurant serves good food. But a great restaurant needs to do more than that. And that's our aim, for every dining experience. The best food. The best atmosphere. The best service. We aim to exceed your expectations every time! Our people live and breathe inspirational cooking and superior service. For our head chef, this means a mastery of the classics, with a twist. Good food, done better. And to a consistently high standard so you’ll always want to come back. Great food needs great wine. And our walls tell our wine story with a display of the many highlights from our list, prepared by our master sommelier, Cameron Douglas. We know we have the basics covered so we’re always looking for our menus to have that element of surprise to them, whether that involves a dish with an unfamiliar ingredient or one cooked in a creative way. You'll find details of all our menus on this site along with our special event menus which are specifically designed for your corporate function or private party. "The world is your oyster, steak your claim in it!"